The ninth largest city in the US, Dallas is known more for business travel and its massive airport — everyone’s been through DFW at least once — than it is for tourism. But don’t be fooled: it’s teeming with enough culture, art, music, food and nature to keep even the most discerning of visitors occupied. Follow these 10 tips and you’ll be primed to explore the city like a local. Let’s not mince words here: the traffic can be soul-crushing at times, but plan around rush hour and you can usually zip around town without too much effort. It’s even less effort if you hail a ride and settle yourself comfortably into the backseat. 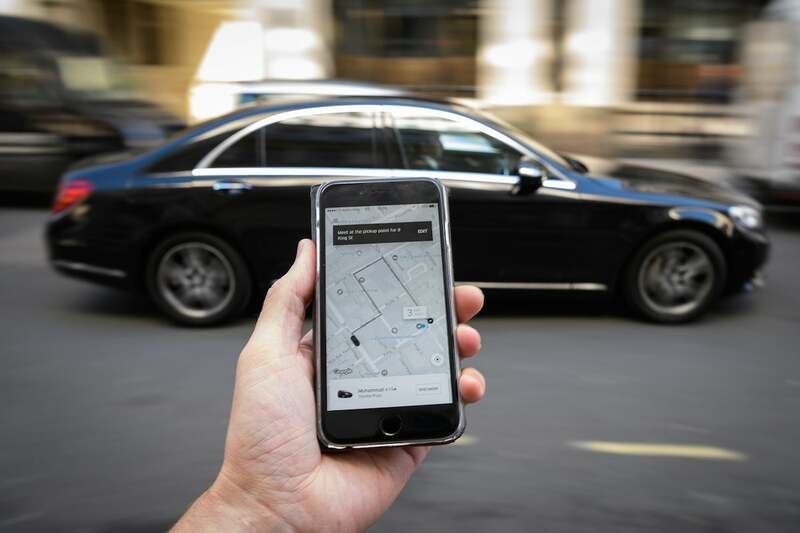 Fortunately, ride sharing options abound, from mainstays like Uber and Lyft to GetMe, which provides rides and even offers delivery services. There’s also Wingz, a set-price private car service that specializes in rides to and from the airport and can be booked in advance, giving you one less thing to worry about before that early morning flight. Dallas has Ubers and Lyfts aplenty. Image by Leon Neal / Getty Images. Dallas doesn’t have the most extensive train system, but it can get you to the airport seven days a week. 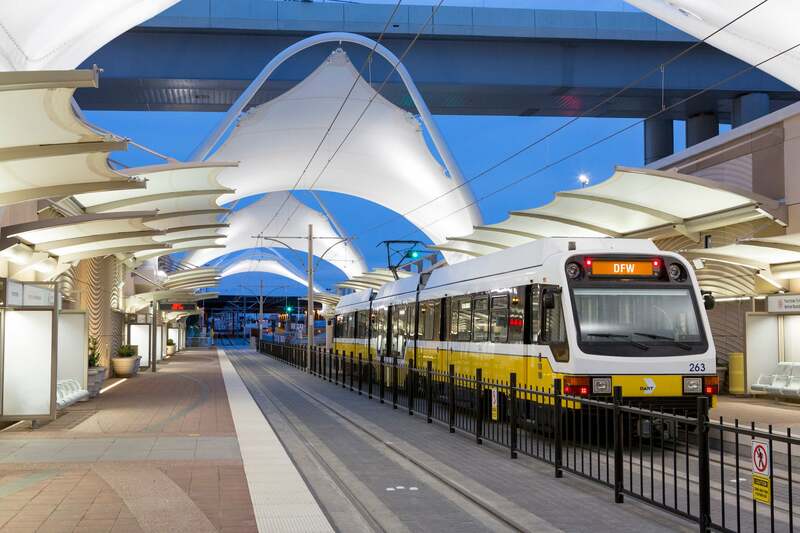 Consult the website for the schedule, then hop aboard the Orange Line anywhere along the rail for a ride to DFW Airport’s Terminal A. If you’re staying along Highway 75 or Downtown, the train can also be a reasonably effective means of transportation between multiple points of the city, including Uptown, the Arts District, Deep Ellum and Fair Park. Take a train to your plane. Image courtesy of DFW Airport. You should really eat some barbecue and Tex-Mex while you’re in town, but don’t fill up solely on brisket and tacos. Dallas’ vibrant Asian communities are serving up some of the country’s best Korean and Vietnamese cuisine. For each, you’ll need to venture outside Dallas proper. You’ll find the original Korea Town at Royal Lane and Highway 35, or visit Carrollton for a newer, larger and always bustling concentration of Korean restaurants, grocery stores and bakeries. For Vietnamese food, North Dallas and Richardson are home to pho shops and delicious banh mi. All over the city, you’ll find excellent sushi, as well as modern Japanese restaurants — Uchi and Tei-An will treat you right — and grilled meat spots like Niwa and Tei-Tei Robata Bar. 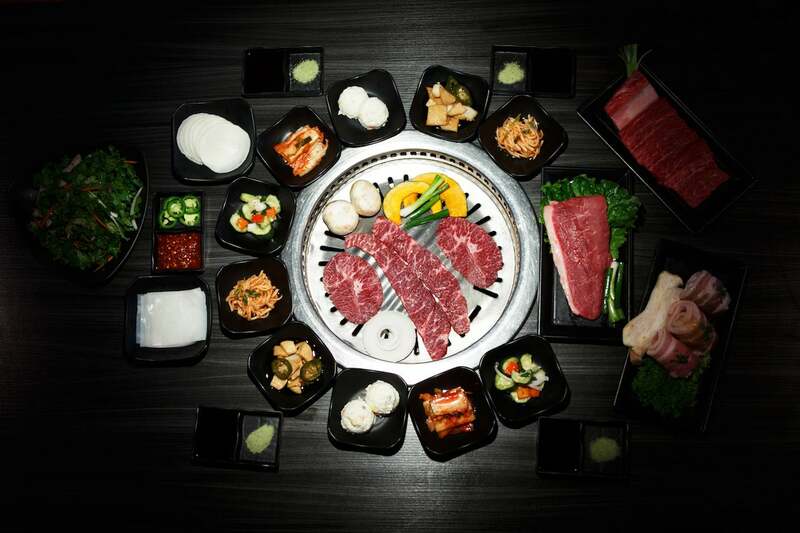 Venture to Carrollton for a traditional Korean feast. Image courtesy of Gen Korean BBQ. Fun fact: Dallas has the largest urban arts district in the nation, spanning 68 acres and 19 continuous blocks. Use all that real estate to your advantage and go see a show at one of the myriad venues, including the Winspear Opera House, Wyly Theater, Symphony Center and the Performing Arts Center. 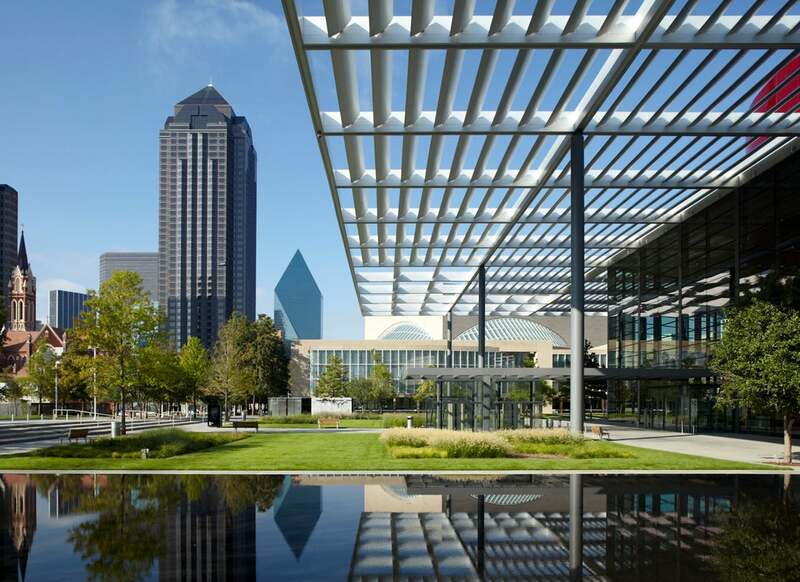 Browse the galleries at the Dallas Art Museum, Crow Collection of Asian Art and the Nasher Sculpture Center, which has an outdoor garden full of oversized sculptures and hosts movie nights on the lawn. See a show or stroll through a museum at the vibrant Dallas Arts District. Image by Dallasborn&bred / Wikimedia Commons. Downtown’s luxury hotels are only blocks away from the shops and restaurants of Uptown, but walking between the two is no easy task. That’s where the McKinney Avenue Trolley comes in. With vintage street cars dating back to 1909, the trolley is free to ride and offers hop-on-hop-off service that runs through the West Village along bustling McKinney Ave to Klyde Warren Park and Downtown. It’s a fun means of getting from points A to B and you can score some great photos along the way. 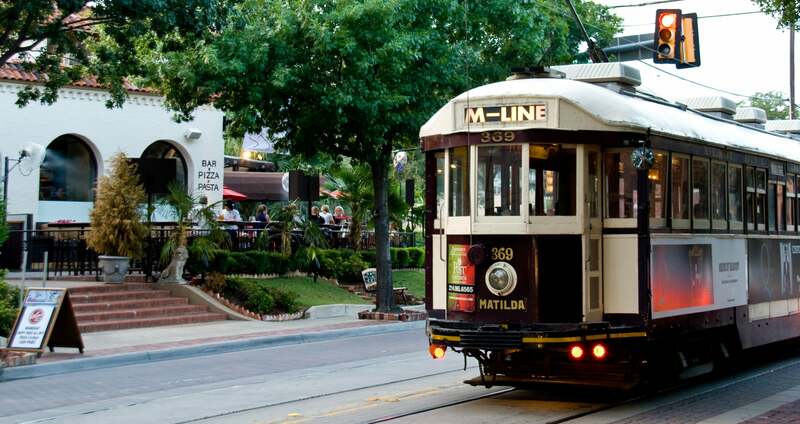 Hop aboard the McKinney Avenue Trolley. Image courtesy of Visit Dallas. The Deep Ellum neighborhood is evolving every day. The area, once known for gritty bars, music clubs and tattoo parlors, has transformed in recent years to offer high-end restaurants, cool cocktail bars and rooftop hangouts. All good things, but fortunately, it still has the music — and the tattoo parlors, if that’s your thing. Join the fray on a weekend and you can expect crowds on the sidewalks and spilling into the streets. Weeknights are quieter, but still offer plenty to do. 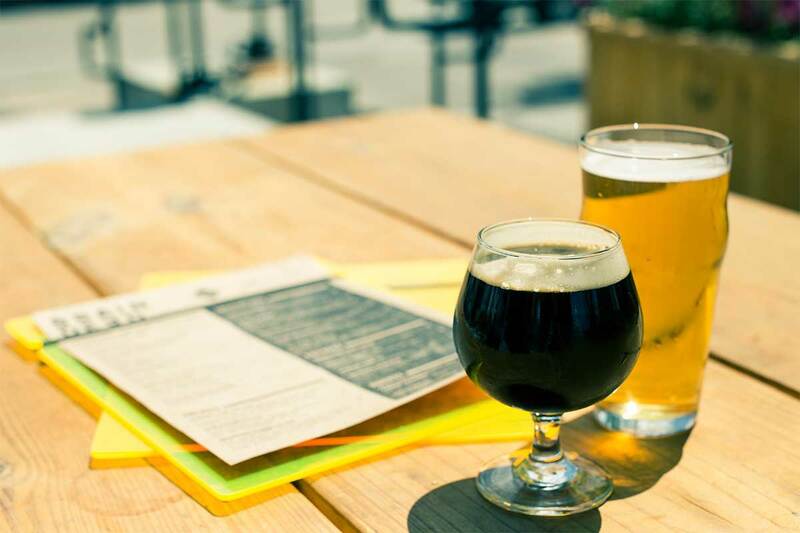 Check off local beers (BrainDead Brewing), science-y cocktails (Hide) and delicious pizza (Il Cane Rosso) from your list before taking in a show at iconic venues like Club Dada, Trees or the Bomb Factory. And before you head home, you’ll obviously need a late-night Grilled Cheese Donut from Glazed Donut Works. Reward yourself with a cold beer. Image courtesy of BrainDead Brewing. Brunch, especially patio brunch, is like a competitive sport in Dallas. 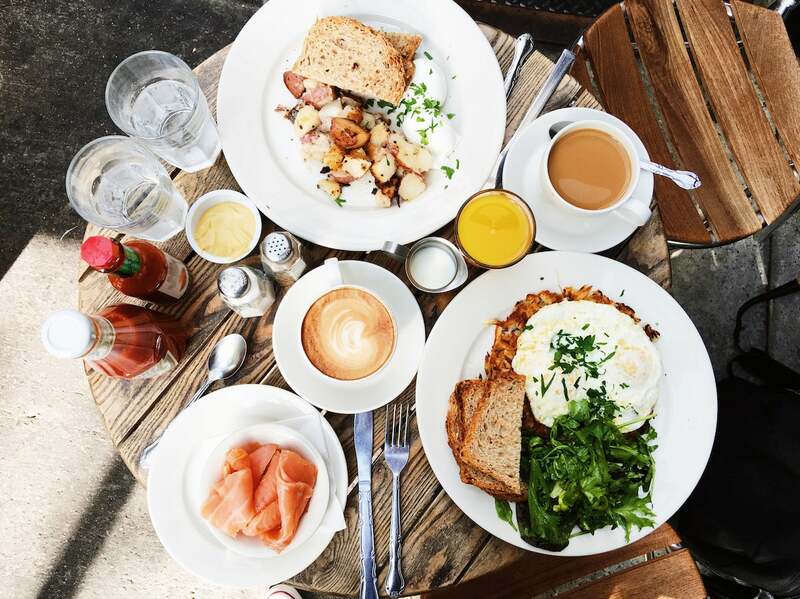 When the weather’s nice — or can be manufactured via the required seasonal mix of mist-spraying fans in the summer and heat lamps in the winter — everyone flocks to brunch-friendly neighborhoods like Lower Greenville, Bishop Arts and Uptown. Everything begins with a Mimosa, some good rosé or a Bloody Mary. The latter might include some truly elaborate garnishes like bacon, shrimp and sliders that can double as your meal. Don’t miss out on everyone’s favorite midday meal. Image by Alexander Spatari / Getty Images. Dallas gets knocked for its lack of nature, but just south of Downtown lies the 6,000-acre Great Trinity Forest. Start your visit at the Trinity River Audubon Center, your gateway to all the forest has to offer, including hiking trails, bird watching and river adventures, like guided kayak expeditions. 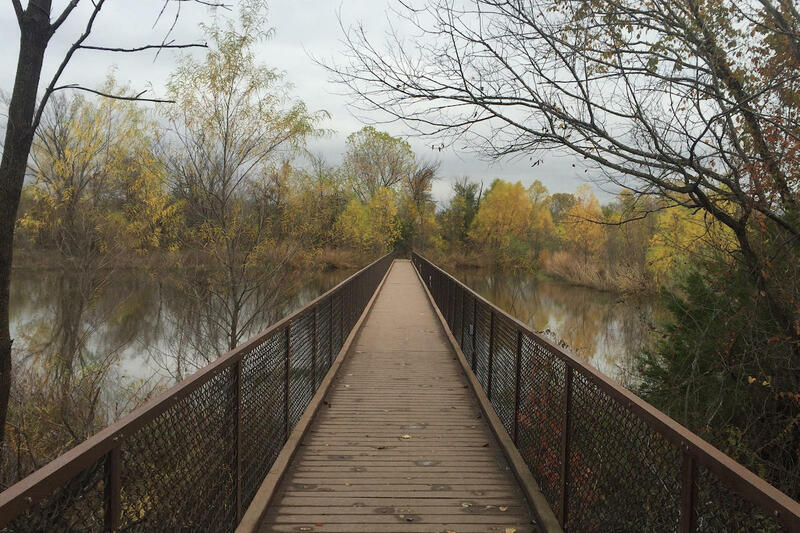 If you’d like to fly through some of those trees, check out the nearby Trinity Forest Adventure Park, which combines obstacle-laden ropes courses with zip-lining and is a great way to spend an afternoon. Enjoy a walk among the trees. Image courtesy of the Trinity River Audubon Center. Just a few miles northeast of Downtown is White Rock Lake, the jewel of the Dallas parks system and a fine spot for some easy exploration. If you want to start slow, sidle up to the water with a picnic basket or bring your dog to the lakeside dog park for a relaxing day. For something a little more active, rent a bike and cruise around the lake’s nearly 10 miles of paved paths, or even better, get out onto the water. To accomplish that, rent a paddle board or kayak or hop aboard a sail boat. With no motorized craft allowed on the lake, the water’s surface remains peaceful and perfect for floating around without a care in the world. 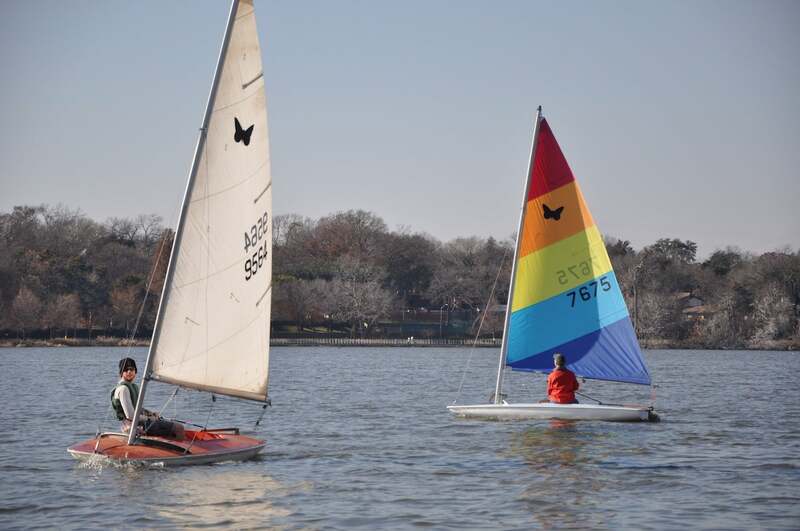 Sail away on White Rock Lake. Image courtesy of White Rock Boat Club. Dallas’s often-overlooked sister city is just 45 minutes away and offers an entirely different vibe. With more than 800,000 people, it’s a city unto itself, but one that operates at a more relaxed pace. Start with a visit to the Kimball Art Museum and the Modern Art Museum, which are conveniently located right next to each other. Then adjourn to Sundance Square or West Seventh for lunch before continuing your day at the cool coffee shops, bars and restaurants along the Magnolia strip. 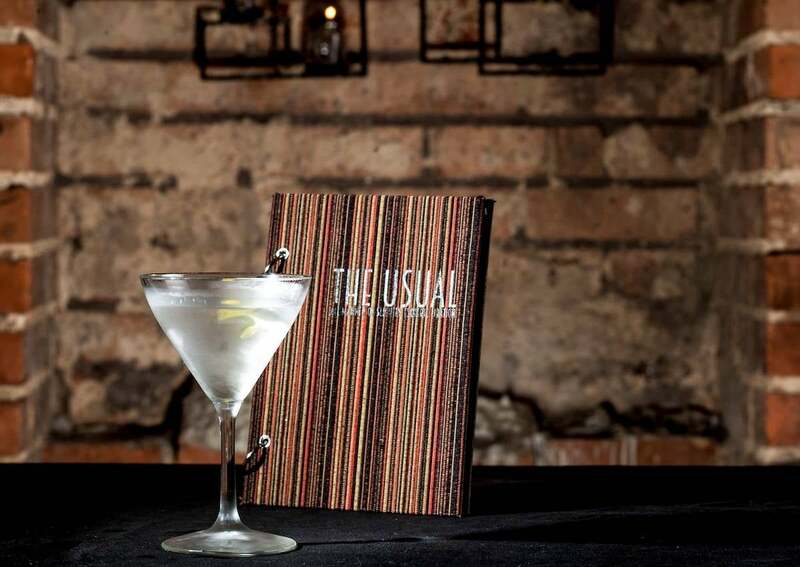 End your night with a well-made cocktail at The Usual and offer up a toast to all that you’ve accomplished. You earned it. Image by The Usual / Facebook. What are some of your favorite things to do in Dallas? Tell us about them, below. Featured image by Dan Huntley Photography / Getty Images.